After many weeks of not blogging, I have decided to try to begin again …. with some changes here. One of the decisions I made was that I will no longer host Taphophile Tragics. I am more than happy to pass the mantle to someone else, so if you are interested, please let me know. Hosting used to be fun, and then started feeling like work, especially because I could never get a link list to work the way I wanted to via this WordPress blog. And, I just started feeling like it wasn’t worth the stress. So, I’m going to try a bit of a restart here, to see if I can get back to what I enjoyed most, which was posting about what I was finding, and putting that information out there for anyone else who might be interested. 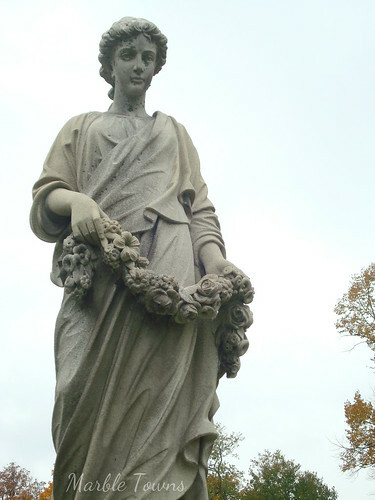 My photo today comes from Oakwood Cemetery in Springfield, Illinois. The Political Graveyard site also lists this information about him: William Allen Northcott (1854-1917) — also known as William A. Northcott — of Greenville, Bond County, Ill.; Springfield, Sangamon County, Ill. Born in Murfreesboro, Rutherford County, Tenn., January 28, 1854. Republican. 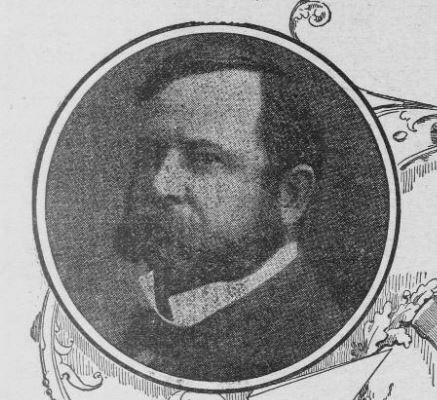 Lawyer; Bond County State’s Attorney, 1882-92; Lieutenant Governor of Illinois, 1897-1905; alternate delegate to Republican National Convention from Illinois, 1904; U.S. Attorney for the Eastern District of Illinois, 1905-14; president, Inter-Ocean Casualty Co. Episcopalian. Member, Modern Woodmen of America; Odd Fellows; Elks; Knights of Pythias; Freemasons. Died January 25, 1917 (age 62 years, 363 days). 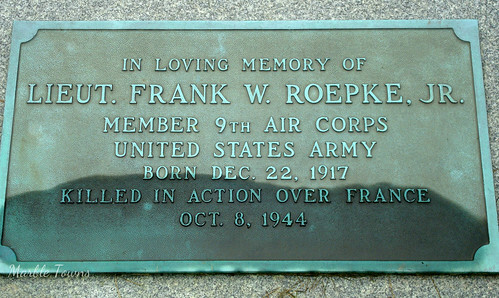 Interment at Oak Ridge Cemetery, Springfield, Ill. Welcome to this week’s Taphophile Tragics! 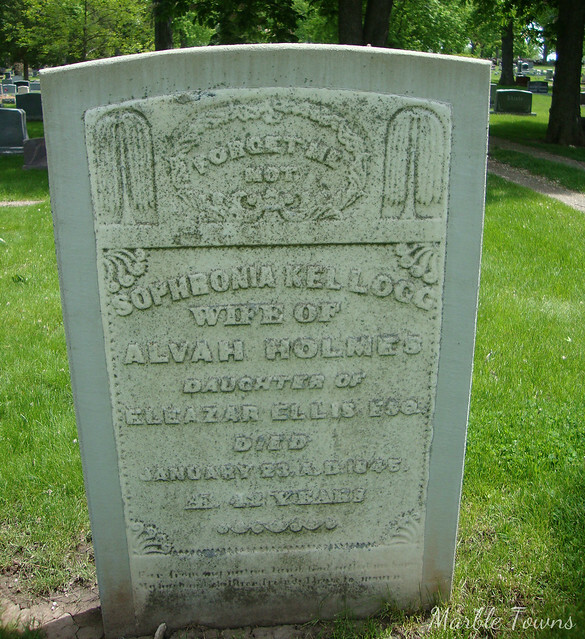 She is buried in Cedarburg Cemetery in Cedarburg, Wisconsin. 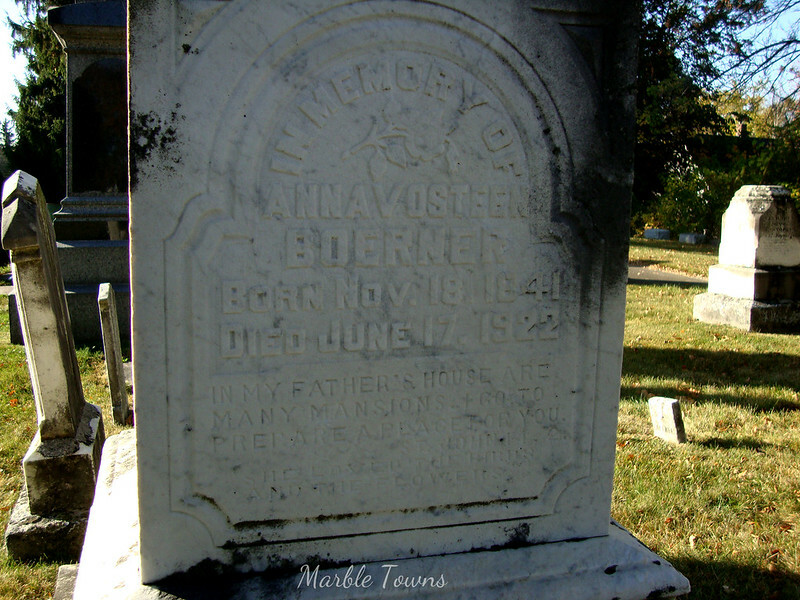 Anna Vosteen Boerner, born 11/18/1841; died 6/17/1922. 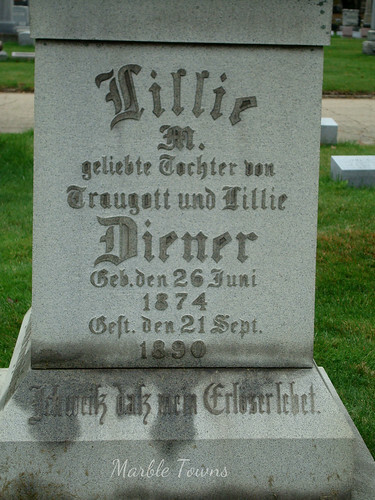 I found her in the 1900 and 1920 censuses, where she is listed as a widow, with several children: Ida, Albert and Flora. One of her relatives posted this neat photo and there is also a family tree for her on Ancestry that has several other images. 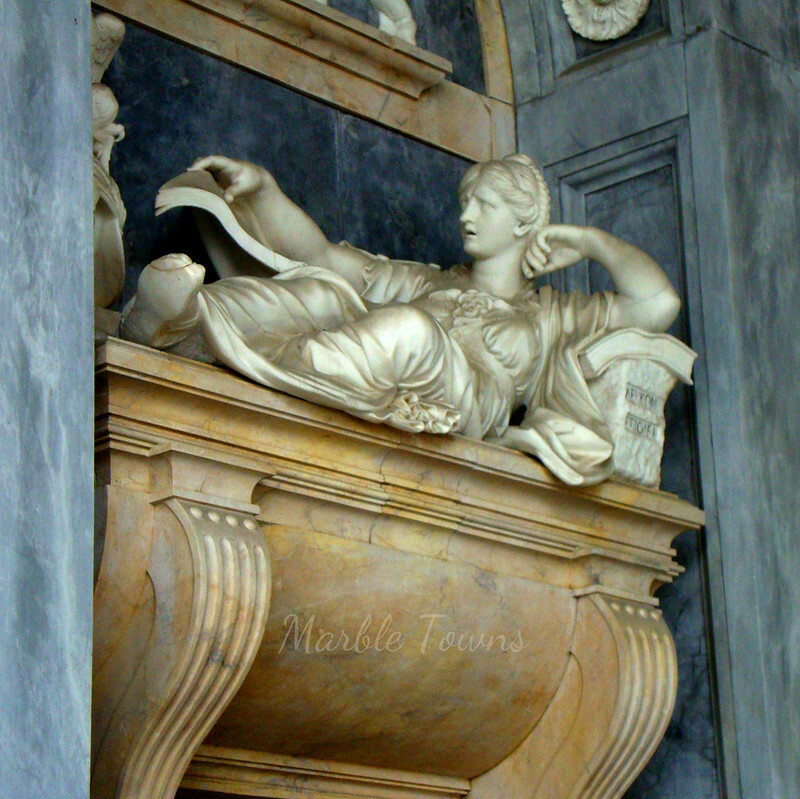 The family tree shows that she was married at age 17 to Christoph Boerner. “In my Father’s house are many mansions: if it were not so, I would have told you. I go to prepare a place for you.” John 14:2 (King James version). She loved the ___________ and the flowers. 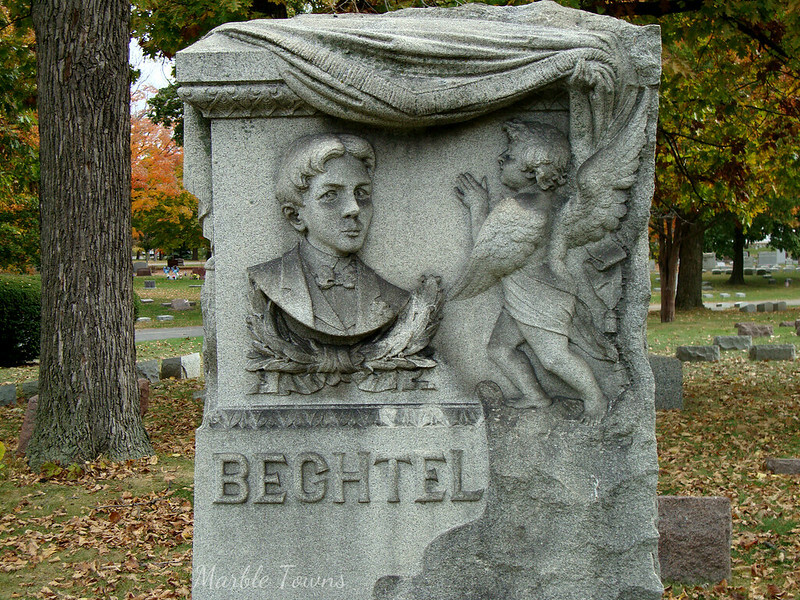 The Bechtel family are buried in Forest Home Cemetery in Milwaukee, Wisconsin. The markers for Mr. John Bechtel and Mrs. Hilda Bechtel are rather worn, but this marker for John A. Bechtel, is quite clear, at least for the images. I found it quite striking that there is a portrait, but also the beautifully winged cherub. It looks to me like the wreath underneath the portrait is laurel, which can represent eternity and immortality (among other things). Welcome to Taphophile Tragics this week! I look forward to seeing your links! 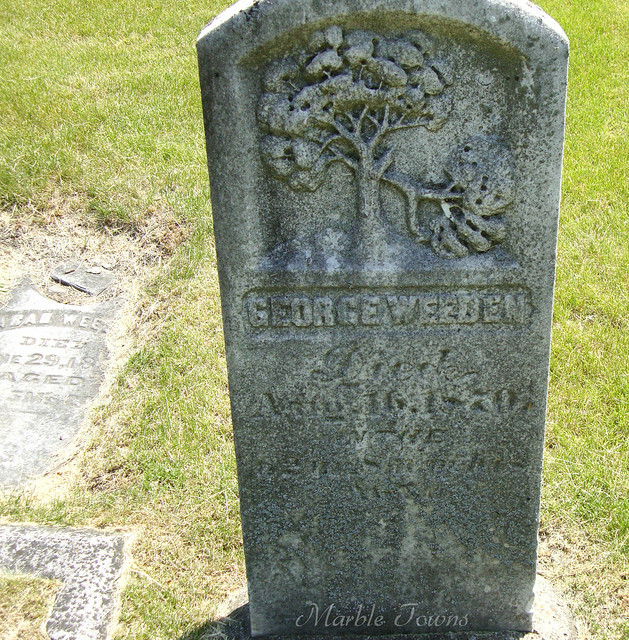 My photo comes from Woodlawn Cemetery in Green Bay, Wisconsin. 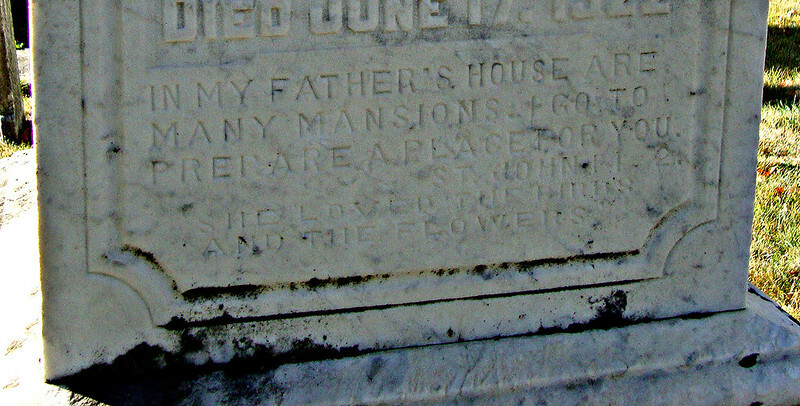 It caught my eye because of the names on the stone: Sophronia, Alvah, Eleazar… I also liked the stylized weeping willows and bits of flourishes still visible. 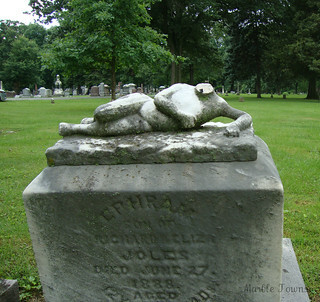 This week, my photos are from Concordia Cemetery in Forest Park, Illinois. I first noticed this marker because of the beautiful figure, but then the German caught my eye. 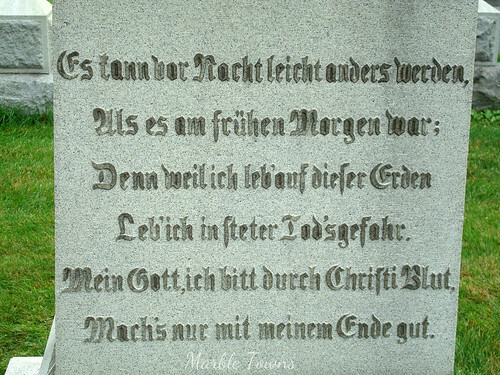 There are many markers in this cemetery that are in German, so I’ve been using Google Translate and Babelfish to help me out a bit (so my translations might not be perfect, I know). One of the most frightful railroad wrecks the Illinois Central has experienced for some time, occurred about seven o’clock at Western avenue, in whioh. at least ten persons were killed and a humler seriously in jured. The fated train was. an excur sion, and had left this city early in the morning with several hundred persons on board, who went to Fern wood, a small station on that line, to spend the day. While returning they had stopped at the Western avenue depot to take water. Shortly afterwards they heard a train oomlng at full speed behind them, and before any one realised the situation, the Chicago, Burlington and Qainoy cannon ball – express dashed into the rear end of the excursion train with the above results. H. S. Carrington, the conductor of the Illinois Central train, H. L. Beaver, engineer, and H. D. Taylor, one of his brakemen, were arrested at their homes late last night There is much conflicting testimony as to whioh railroad is to blame for the accident, and it rests with the borcaor.. who will be called upon to dooide. The killed and injured were: Theodore Burger, Lillie Diener, sixteen years of age; Margaret Diener, fourteen years of age; Otto Sohloeff, thirty years of age; unknown man, about twenty – seven years of age. Those fatally injured were: Lena Res – wig, left leg broken and crushed about upper part of body; Louis Toerse, nineteen years of age, legs crushed and severe internal in j uries. There were fifteen others injured, among them being Bionard Hoffman, left log injured; Lobert Hoffman, right wrist hurt;. Eugene Keorn, two ribs broken; Henry Lutz, left leg fractured; Chus. Melrose, arm broken; Wm. D. Schmidt, (eft hand crushed; Otto Sohloff, who was badly injured, died shortly after being removed to the county hospital. 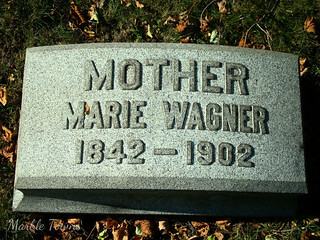 I didn’t remember seeing Margaret’s name on this marker, and the listings in Find a Grave do not show her in this cemetery, so I believe she was injured in this accident (and not killed). 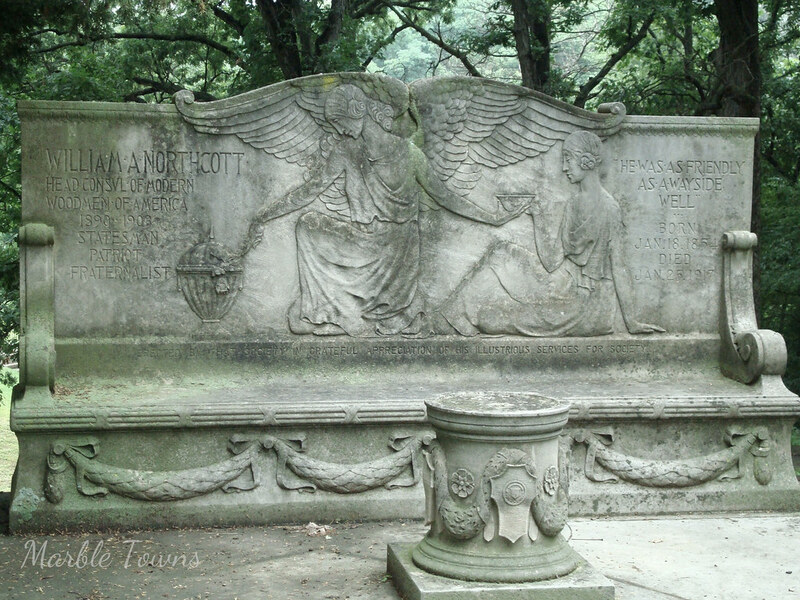 Their parents, Lillie and Traugott are also buried in this cemetery. Welcome to Taphophile Tragics! And welcome to a fresh new year, as well! This week, my offering comes from Concordia Cemetery in Forest Park, Illinois. I found information about the 9th Air Corps in both the Army Air Corps Library & Museum, as well as on a page that’s all about the history of the 9th Air Corps. Welcome to this week’s edition of Taphophile Tragics! My list is powered by Linky Tools — please Click here to enter your link and view this Linky Tools list. I appreciate that you’ve stopped by — and I look forward to seeing your posts! Forest Home Cemetery, Milwaukee, Wisconsin. I found them on the 1870 census, which shows Julius, aged 37 and “Mary” aged 29. The census shows they have several children: Laura, Richard, Oscar and Matilda. The form also shows a Edward Wagner – with an age of 10/12 (which makes me wonder if he was not their child, but another relation), and Frederica Smith, aged 14. Frederica is listed as their domestic (which makes me think she helped keeping house and with childcare). 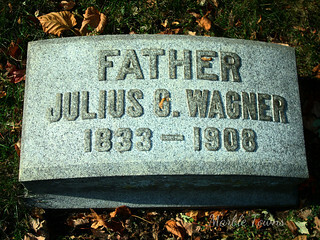 By the 1900 census, Julius (age 66) and Marie (age 56) are sharing their household with Richard Wagner and Milton Wagner (Richard’s son), Maria Fuchs, Kittie Siegert, Julius P. Wagner and Richard Wagner. Julius and Richard are listed with the occupation of bridge builder. Maria and Kittie are both listed as servants. 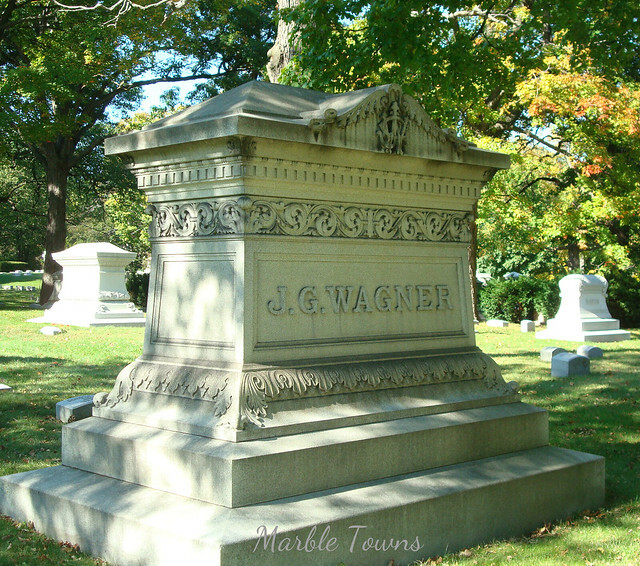 It makes me think that the Wagners were doing pretty well, financially, at least. So, in doing more research, I learned more about them — Julius apparently owned an iron/bridge building company in Milwaukee, which I think is the Wagner Company, begun in 1870, and which still exists today. 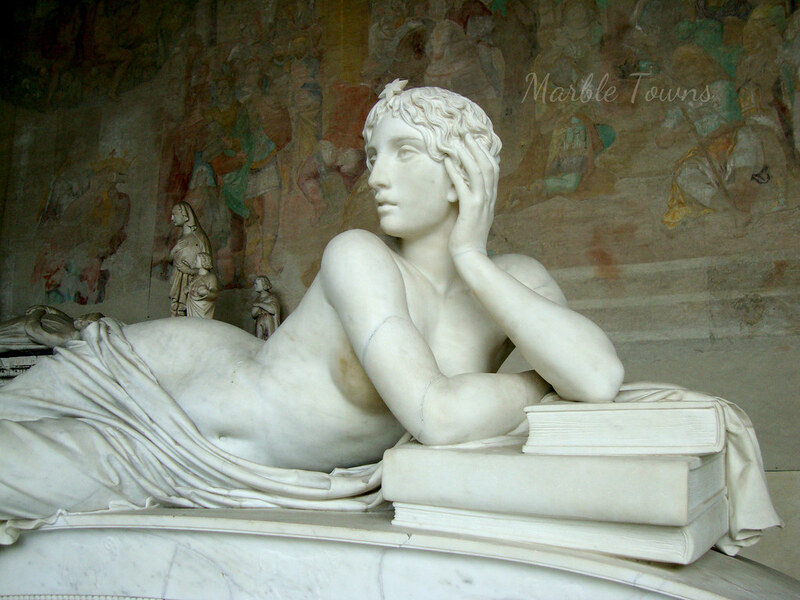 Welcome to Taphophile Tragics on this blog! I’m not counting the weeks anymore — I’m just presenting it weekly. And I’m glad to have you here! Please do feel free to post your link(s) — it’s always nice to see what people are posting. My photo this time comes from Elmwood Cemetery in DeKalb, Illinois. The stone is pretty worn, although the tree with the broken limb is still quite clear. 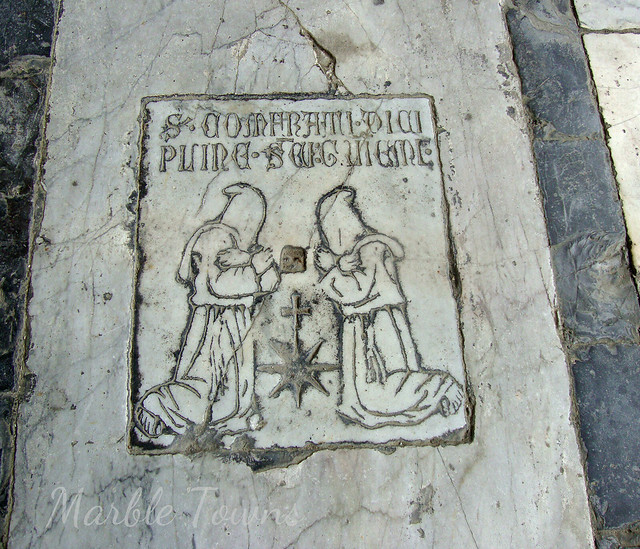 This symbol, usually of a life cut short, is something I have seen before – although it’s nice that this one was carved deeply enough that it’s still in great condition. Behind this stone and slightly to the side, you can see the broken stone of George’s wife, Sarah. According to the vital records I found, George was born on December 23, 1807, the son of Samuel Weeden and Marcy Miller, in Hartland, Vermont. Looking at the 1860 census,it looks like George, a mason, is living with Sarah and another woman, Albina Martin, and a young boy, George Martin. It’s hard to tell from the handwriting on the census whether Albina is their daughter — but I’m assuming George is her son. I found George and Sarah on the 1870 census, where it lists them along with their son, Lucien, age 14. At his age of 62, George is listed as a brickmason.